I know how to make the basic arch and columns. I'm just not sure the easier way for the cancer ribbon frame especially when it comes to the crossing. 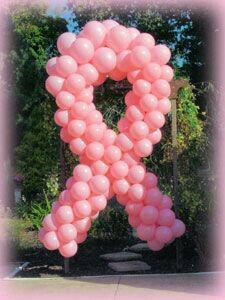 I'm not sure yet of the size but I just need to know easiest and best frame for an outdoor relay for life event. Thank you so much. For a free standing outdoor sculpture like you have in mind, it is best to use 1/2" aluminium rod. Or, if you want to make it extra sturdy, you could go with 1/2" PVC conduit (but this is more difficult to bend into the desired shape). A good strategy is to draw out your desired shape on the floor (perhaps with chalk on your drive way, or with a marker on a big plastic sheet), then bend the frame accordingly. Where the frame crosses, use duct tape to hold the rod or pipe together firmly. 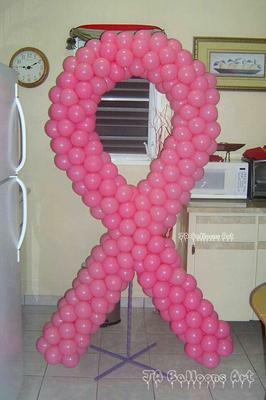 Please also check out the tips about bending frames and PVC pipes on this page about making a balloon heart decoration.